Dear God. Or Jehovah. Or Jesus. Or Jupiter. Or Allah. Or Buddha. Or Zeus. Or Gwydion. Or Yahweh. Or Beelzebub (yeah, I’ll go there). Or G_d. Or Thor. Anyone. Whoever is out there listening. NO MORE motherfucking SNOW! Enough already! I’m a beaten man, okay? 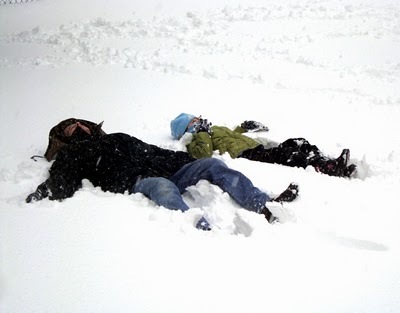 Every weekend there’s a fresh 8-12 inches of new snow dumped on our asses. You’ve beaten me. You’ve beaten us all. You’ve beaten the entire northeast corridor from Boston down to D.C. You set a record for snowfall. The most ever. Good for you. Well done. But that’s enough. Okay? More relaxing than it looks. 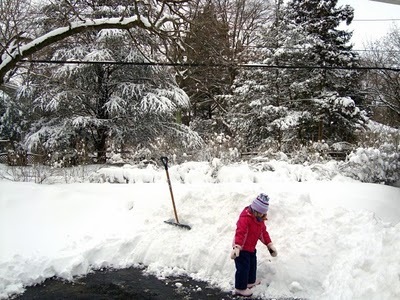 Drifts taller than a 3-year old. 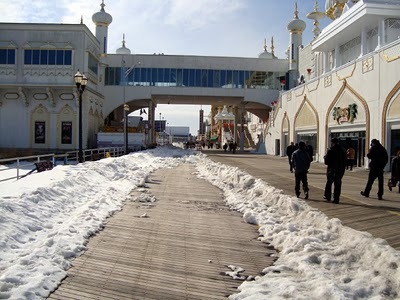 Atlantic City is a much sadder, slower place in the winter than it is in the summer. It makes me melancholy and blue. But it’s the good kind of blue. It’s not the kind of blue that drags you down. It’s the kind of blue that makes you sit up straight and appreciate what you have. 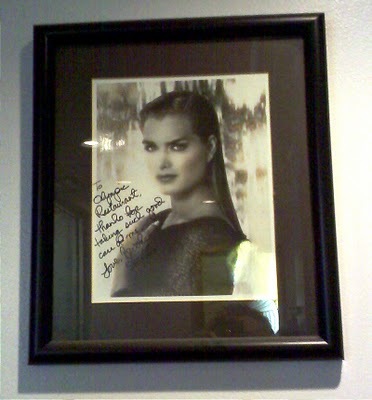 It’s the kind of blueyou get when you listen to B.B. King play his guitar or Billy Holiday sing. I like it just fine. I certainly don’t mind navigating the summer masses that choke the boardwalk. If crowds bothered me, I wouldn’t have stayed in New York City all those years. 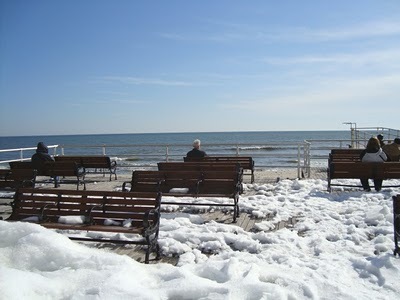 But there’s a certain sad allure to strolling on a cold, snowy, almost empty boardwalk. 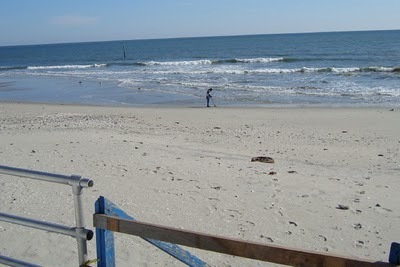 The beaches are deserted and clean. The lines where sky meets water and water meets sand aren’t broken by a gaggle of noisy tourists. By the end of August, the sand will be disrupted and large metal drums filled with trash will dot the shore. 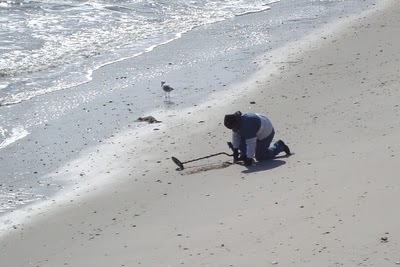 Occasionally, a treasure hunter with a metal detector will come into view. He’ll stop, bend down and dig furiously. His efforts will be rewarded with a bottle cap or a key. 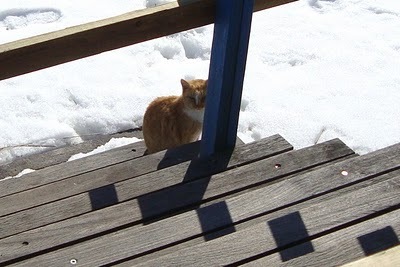 Though chilly, the sun can be quite bright and sitting outside is comfortable. 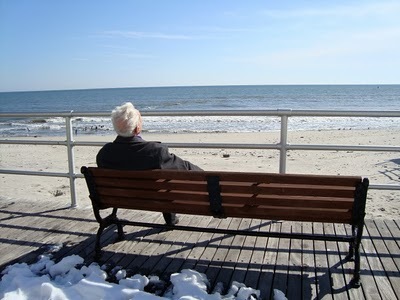 The broken, the lonely and those brought to their knees by their bad luck in the casinos claim a bench and stare out at the ocean. The oul dogs wonder where it all went and what’s left. 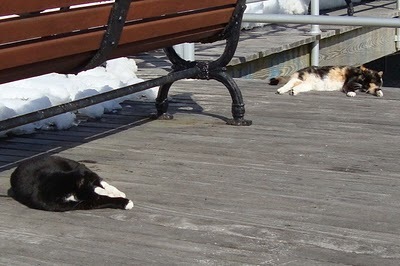 There’s a colony of feral cats that live under the boardwalk. They’ve been there for as long as I can remember. Local volunteers have built shelters for them and drop off food in the winter time. You can see them napping in the afternoon sunshine. Nobody bothers them. They don’t seem to have any fear of people. They will almost always jump up on your lap if you invite them. And, like us, they enjoy a good scratch in the right place. Mrs. Wife borrowed her mother’s fondue pot. Fondue was a fad back in the ‘70s but I don‘t think people bother so much anymore. First, we skewered cubes of New York strip steak and fried them in peanut oil. 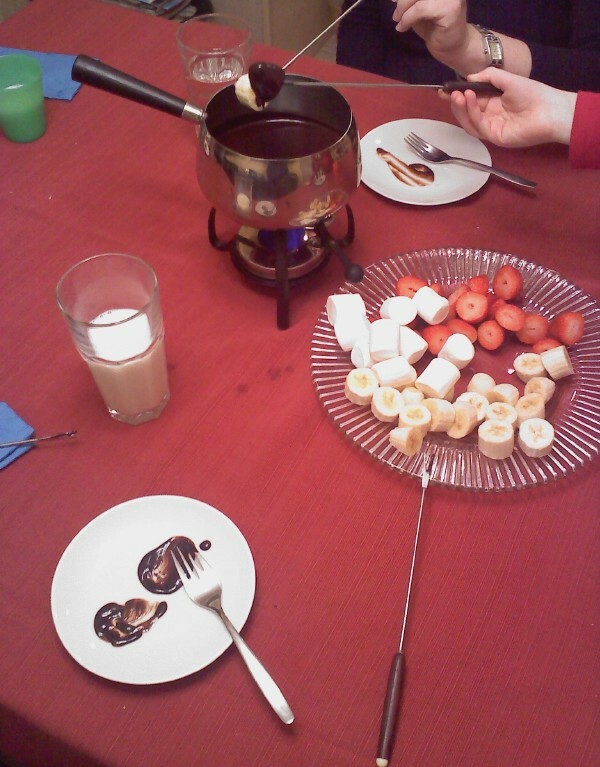 For dessert we melted chocolate and dipped bananas, strawberries and marshmallows. (That’s my tall, cold glass of whole milk.) The dessert must have been too rich, or we ate too much, because it gave 8-Year Old Daughter and I a bit of a tummy ache. Happy news for New Yorkers and those who like to visit: The experiment to close off sections of Broadway and turn them into pedestrian malls is going to be made permanent. The city set up chairs in what use to be the middle of Broadway and, weather permitting, you can spend all day and night just watching the world pass by. It’s fantastic! This has not been a blessing for traffic, but merchants, tourists and residents love it, and that was enough for Mayor Bloomberg to make it permanent. That guy is the world’s only populist billionaire. Cynical old me keeps waiting for an out-of-control taxi to careen off into a crowd of tourists relaxing in lawn chairs but it hasn’t happened yet, thank God. 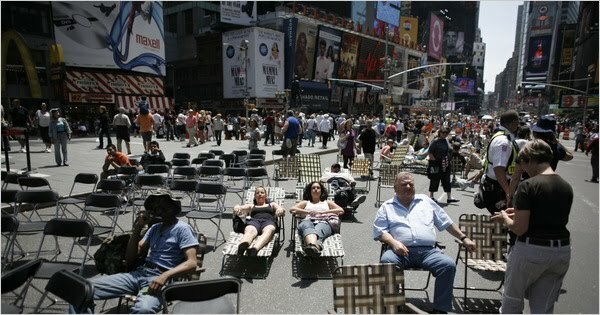 The pic above is from Times Square but my favorite spot is in Chelsea at the foot of the fabulous Flatiron Building. 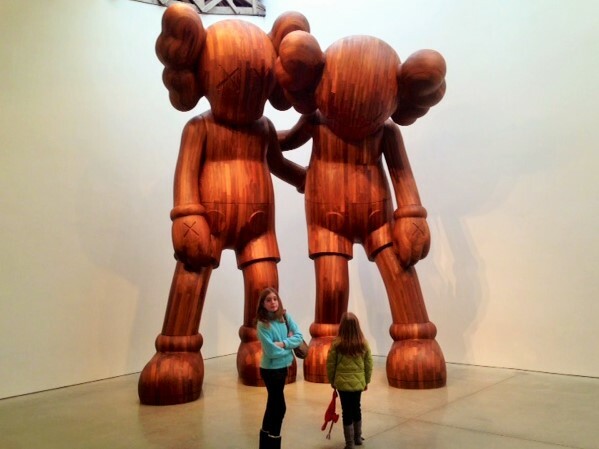 (Take a look at this pic from last year.) Given the choice between sitting before a pretty countryside or this, I’ll take the pavement and people-watching every time. The Broadway revival of The Miracle Worker that’s set to open next week would be a good night out if the show hadn’t been staged so poorly. The cast is good and occasionally achieves greatness. Abigail Breslin gives a controlled performance as Helen Keller that could have gone way off the rails. 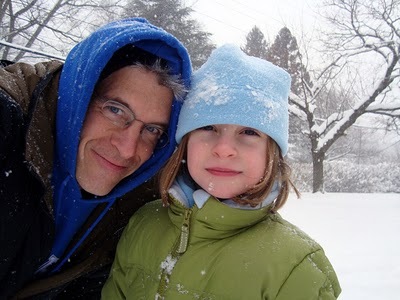 I felt a genuine thrill in the climatic scene where she discovers language. Initially, I thought that Alison Pill was too young to play Annie Sullivan but she was fine, as were Matthew Modine and Jennifer Morrison. But the staging is a mess. It’s at Circle in the Square and the seating is in the round. This is a play that begs for a traditional theater. The blocking is so poor that I found myself starring at the actor’s backs about 60% of the time. I’ve seen plays at Circle in the Square before, including the 6-hour Norman Conquests, which was masterful, so I know it can be done. The set changes are accomplished by raising and lowering furniture pieces from the ceiling. Part of the set design includes door frames (with closed doors) that block the view for many patrons. The actors were rooted on their marks, so if you happen to be staring at the sides of their heads during a scene, too bad for you. It pains me to see actors work so hard only to have their efforts undermined by the production itself. Ah, well. That’s show biz. NEXT! Hey Greeks! How do you do it?! 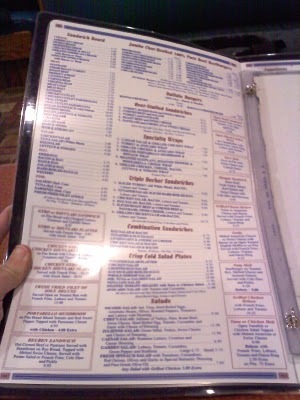 If you eat in a diner, 9 times out of 10 it’s going to be owned by a Greek family. 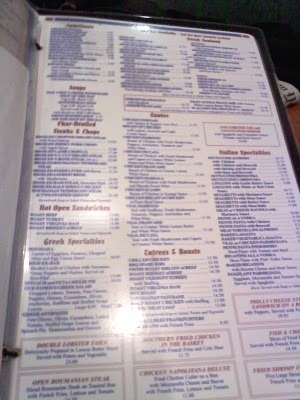 I love Greek diners. Who doesn’t? They are home away from home on a plate. This beauty is located at 8th Avenue and 50th St. This doesn’t even include the daily special inserts. There must be 200 meals here! These are small New York restaurants with small kitchens. WHERE DO THEY KEEP ALL THIS FOOD!? Try to imagine stocking your pantry with enough items to prepare any one of these meals on a moment’s notice. 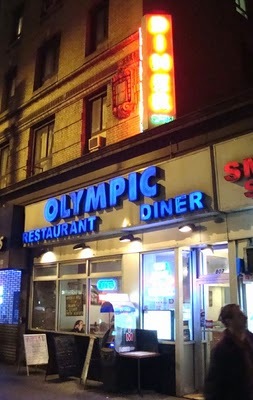 One table can order veal parmesan, a full pancake breakfast, a Greek salad, fillet of sole and a bowl of matzo ball soup and it will all arrive at the same time piping hot. It’s an impossible task but they succeed. Go Greeks! 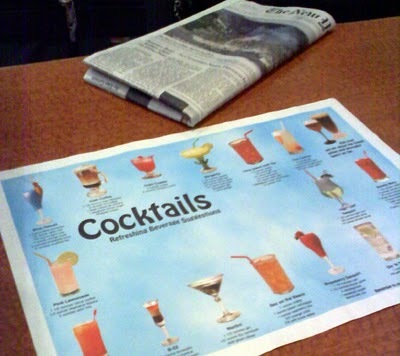 …and the refreshing cocktail suggestion placemat. There’s always a seat at the counter, a bottomless cup of coffee (unlike Starbucks) and they keep the daily newspapers on hand for you to read while you eat. I love ‘em.